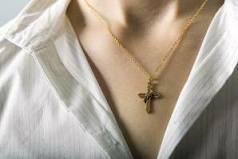 Do Christian employees have the rights to wear a cross at work? In this article we look at recent employment law cases and whether Christians have the rights to wear a cross at work. On 15 January 2013 the European Courts came to a decision on the well known case of the British Airways‘ employee, Mrs Eweida, who was stopped form wearing a visible cross at work. The Court decided that Mrs Eweida’s insistence on wearing the cross visibly was a manifestation of her religious belief and was therefore protected. The refusal of British Airways to allow her to wear a visible cross at work was an interference with her right to practice her religious beliefs and therefore rights to wear a cross at work. 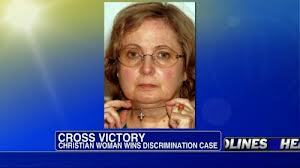 The Court then had to decide if the refusal to allow her to wear a visible cross could be justified by BA. On one side of the scales was Mrs Eweida’s right to manifest her religious belief; on the other side was BAs’ right to project a certain corporate image. They took into account that there was no evidence that the wearing of items such as turbans and hijabs, by other employees, had any negative impact on BA’s image. The Court decided that BA’s desire to protect its corporate image was not sufficiently important to displace her right to practice her religion through wearing a visible cross. She won her case and was awarded her 2,000 Euro in compensation. At the same time the Court also heard another case. Ms Chaplin was a geriatrics nurse at an NHS hospital. Following a uniform change, a cross she had worn for some time became visible and she was prohibited from wearing it by management for clinical safety reasons. She persisted in wearing the cross and was moved to non-nursing, administrative duties. Ms Chaplin lost her case as the Court found that the employers clinical safety reasons were enough to justify the restriction on her wearing a visible cross. The Court also threw out two other cases. Ms Ladele, a marriage registrar with Islington Borough Council refused to officiate at civil partnerships due to her faith. Mr McFarlane, a counsellor with Relate who refused to provide psycho sexual counselling to homosexual couples on the basis of his religious beliefs. They were both dismissed because of the organisations’ commitment to providing services in a non discriminatory way. The aim of protecting the rights of others not to be discriminated against has been upheld as a valid justification for not accommodating an employee’s religious views, even where the effect on the employee is that of losing their job. What does this actually mean? The lesson for employers is to just try to be reasonable and as long as you can explain why a particular policy is necessary, you’re probably fine. You should try to accommodate religious beliefs in the workplace if that is reasonable.